Zerrick Pearson is the vice president of information technology for Five Guys Enterprises, L.L.C., a company that operates more than 1420 franchised or company-operated restaurants domestically and internationally. Zerrick is responsible for developing and implementing information technology initiatives across the Enterprise. Having been born into the restaurant industry through family owned restaurants, Zerrick has been involved in restaurant operations for almost 25 years. Zerrick has recently implemented a cloud-based POS solution that allows Five Guys to leverage new and emerging technologies to drive efficiencies while focused on improving the customer experience. 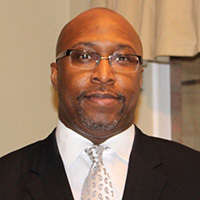 Prior to his time with Five Guys, Zerrick held the position of vice president of information technology with a publicly traded Washington, DC based Company. While there Zerrick managed all IT initiatives, bridging the gap between IT, finance and operations. Zerrick is a member of the IFBTA and various other industry-specific IT organizations.